Spring is a season of renewal, and rejuvenation which always feels imperative after a season of turning inward and reflecting. When springtime comes, I feel like I want to hang myself out on the clothes line and let my anxious mind, and my chilled bones be aired out by the cool spring breeze. It feels so refreshing to have a glimpse of spring, even if it's just a day or two of warmer weather, being able to open up the windows, let the fire die down and sit on the porch listening to the chorus of birds. Right now, everything is wet. Every walkway, every field, every garden bed, everything! This has become quite frustrating for us because we are trying to prepare beds for spring. But instead they are mud piles, squishy mud and thick as glue! It’s time for a couple of very sunny and dry days, so we can clean out the grass from our newly tilled beds, prepare them, and then plow and disc our main field and our neighbors field in order to start planting and set out the irrigation. We are ready to get a move on it! I feel the excitement in my bones! Currently we are tending our seed starts, our little chicks, and building rabbit hutches, farm stands, farm signs, fencing, painting bee hives, building tables, mulching, pruning fruit trees, planting trees, finishing our kitchen and more! It has been an amazingly productive year so far! When I think about how much we've accomplished, I think HOLY COW that's awesome and then I feel exhausted just thinking about it. Currently, we are preparing all of the structures that we will need throughout the year, as we wait for the ground to soak up the water and the plants to grow. We are starting up the sign up process for weekly flower arrangement delivery CSA and the monthly Farmer's Hands to Table Supper Club. Both of these are services that can be subscribed, given as gifts, possibly done with work share. To explain a little more, we have include some more information about these services. 12 week local and unique flower arrangement CSA. We grow special varieties of flowers to share with the community, and have unique country and playful arranging techniques. By supporting The Farmer's Hands Flower CSA you are supporting the passions of two young farmers and having the opportunity to provide yourself with fresh floral inspiration every week. We always use flowers that we grow, but based on seasonality and availability. We supplement with unique greenery, leaves, dried flowers and woody plants when necessary. Please provide us with a drop off location at your home that is shaded and protected from wind for the arrangement to be delivered. Please make us aware of any food allergies at least 2 weeks before the event. This is a dinner CSA, the purchase of a ticket enables us to buy seeds, grow vegetables and flowers and helps us create these wonderful events. By supporting The Farmer's Hands to Table dinner CSA you are supporting the passions of two young farmers to create a hand made life that they want to share with the world. Our farm stand will be open during events where you can purchase vegetables, fruits, flowers, and eggs. Availability will vary based on seasonality. By purchasing this ticket you are buying a share in The Farmer's Hands Homestead, and you are purchasing vegetables and flowers from our farm. This ticket is not payment for a service (that is our donation). ‘Tis the season! And what’s better than some home made gifts? Here are two really easy and fun ideas for home made gifts that are economical, pretty, and will give the receiver lots of joy. The first idea is for a lavender dream pillow. This is quite simply a piece of cloth, like a nice handkerchief, that is filled with lavender and then tied off with string. We have a few around the house and in our cars, but they are best kept in your pillow case, where you can smell the lavender as you fall asleep. Lavender is great for relaxing and promoting a feeling of calm, so it’s really nice to breath in the scent of lavender at bedtime. We grew all the lavender ourselves and found some vintage handkerchiefs at the Goodwill to use for this project. The other idea is to give your friends and loved ones some home grown tea. You can make tea from just about anything, mint, holy basil, raspberry leaves, stinging nettle, the list goes on and on. We grew lots and lots of mint and holy basil this year and have been drying it in the pantry since harvest time. To make the tea, you simply remove the leaves and flowers form the dried stems and give them a buzz in a food processor. Place them in a jar and make a nice label, and presto, you have a gift of home made tea! To drink, just put some of the dried leaves in a tea ball or tea bag, add some hot water and steep till it’s the strength you like. As a kid living in Africa, we would drink lots of mint tea that was really really sweet. The guys making it would pour it back and forth between cups, holding their arms at great lengths from each other, to properly mix and aerate the tea. It was super tasty and really cooling and energizing on a hot day. Holy basil is really healthy and kind of amazing, as it’s an adaptogen, meaning that it will help you adapt to both physical and mental stress! Holy basil, also know also Tulsi, imparts strength, energy, mental clarity, and stamina. Overall it's an amazing tea to drink whenever you are feeling stressed or you just need a bit of a pick me up. Nature is incredible! Seriously, the things that you can do with plants in their natural state, without doctoring or altering them much is simply astounding. Let me explain. I took a fairly sizable chuck of my finger off the other day while chopping kindling. Yes, I cut a piece of my finger off with an axe. The finger is going to be fine, just not looking forward to a lengthy healing process and not being able to pay music for a long time. But I digress. When it happened, it was late at night, and all the urgent care facilities had already closed, and it wasn’t worth a trip to the ER. Besides, my experience in kitchens has shown me that unless you take a very large piece of your finger off, meaning you’ve gone through bone and are past the first knuckle, there is nothing you can do about it. This knowledge however, didn’t really solve the problem of the continuos flow of blood and did little to comfort me. So what now? Ariel to the rescue! Ariel is a very skilled herbalist and knew to immediately to run to the garden and grab some yarrow. Yarrow, (Achillea Millefolium), has amazing blood clotting abilities and has been used for centuries for this purpose. The first part of its latin name, Achillea, refers to Achilles, who would take it into battle with him to treat wounds. It goes by other names that allude to it’s blood staunching properties: soldier’s woundwort, staunchweed, thousand seal, and sanguinary, to name a few. It has other medicinal uses as well. Essential oils made from yarrow are used as an anti-inflammatory and Native Americans use it for anything from a toothache to a fever reducer and sleep aid. So how does it work? All you have to do is chew it into a pulp to create a poultice (it tastes horrible, by the way,) and place it on the wound. Within seconds, literally seconds, the bleeding stopped. We applied yarrow to the finger three times, and it hasn’t bled since. This is pretty incredible considering the size of the cut. I would highly recommend you plant some yarrow. It is a perennial herb, and is easy to grow and comes in extremely handy in an emergency. Yet, maybe most importantly of all, there is just something intangible and ethereal, even hallowed, to the idea of using an ancient plant, a plant that has been used for this purpose for ages, a plant that just grows in our backyard, to heal. It feels as if you are making a connection with a much older, more primitive version of yourself, and that is what makes nature so amazing, and it’s also why we do what we do; to chase that feeling. I was just at our local farm stand and they had a bin full of onion sets! 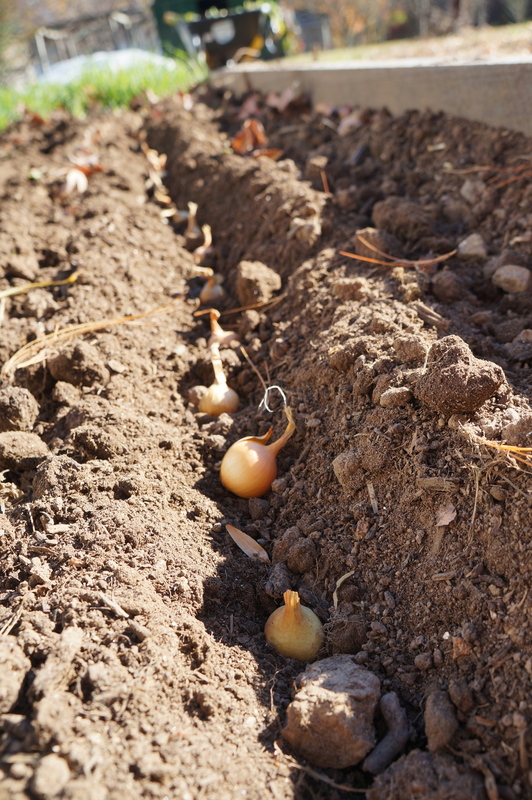 Onion sets are basically baby onions that you plant and will grow into full size onions. They are usually pretty cheap, less than two bucks a pound, and are really easy to plant and grow. We grew quite a few onions this spring, and are still enjoying those, but I don’t think its enough to tie us through the winter, and these aren’t going to help that situation much, as they will establish themselves over the next few weeks, before it gets too cold, and then go dormant till it warms again in spring, at which point they will be ready to harvest pretty quickly. We will be covering them in low lying row cover to keep them as warm as we can and hopefully we will have a few baby onions and scallions to play with this winter. We just had our first snow! Almost 6 inches over the course of a day and a night, and it was beautiful. We got really sticky snow, so each little branch and leaf on all the trees was covered in snow, making for an incredible picture. It was especially striking as most of our trees still have leaves on them, all in shades of orange, red, and yellow; made only more vibrant by the pristine white snow. It was really quite something. But I digress, we knew this snow was coming and had planned accordingly. One major project on that plan was to dig up our Dahlia tubers so that we can store them over the winter and replant them in the spring. Dahlia’s are native to Mexico and parts of South America, and are therefore not resistant to freezing temperatures, especially not the freezing temperatures we get here in the mountains. Thus they need to be dug up before the first frost and stored in a cool place for the winter. We have a make shift root cellar under the stairs where we have this years sweet potatoes, and this is a perfect pace for them to rest. We grew quite a lot of Dahlias this year and have been enjoying them since the early spring, in bouquets in the house and just out in the yard. The digging process was really simple; just gently dig them up, brush off the excess soil, store on a rack that allows some air movement, and that’s it! They will keep great in our root cellar and we will re-plant them in the spring. They did double in size over the past year, so I think we will have an even better growing season next year! We also took this time to plant some Tulip bulbs. As a proud Dutchman, it would be unacceptable to not have Tulips growing at the house, so we planted about 50 bulbs of a few varieties. These are really simple to plant: pointy end up, about 6 inches deep in rows or clusters, and covered loosely with soil. They don’t need to be fertilized as they are little storehouses of food and nutrients. Now we wait till spring and hopefully we will have a beautiful bloom! One of my favorite things in the world is garlic. People say that bacon makes everything better, and although that may be true, and I do love my bacon, I could argue that garlic should have the right to that statement. It’s just so delicious, healthy and amazing and so much fun to grow! Fun in the sense that it’s just about the last thing that you plant at the end of the year, and one of the first things that you harvest in the spring. And if you plant hard-necks like we did, you will be rewarded even earlier with garlic scapes, a tender springtime treat like no other. Hard-neck garlic has fewer cloves all set around a center stalk, hence the name. The center stalk is the flower stalk, and this will shoot up in early spring and give you scapes. These need to be removed otherwise the plant will flower and not grow a large bulb, and that goodness for that, as pickled garlic scapes are amazing, not to mention garlic scape pesto! 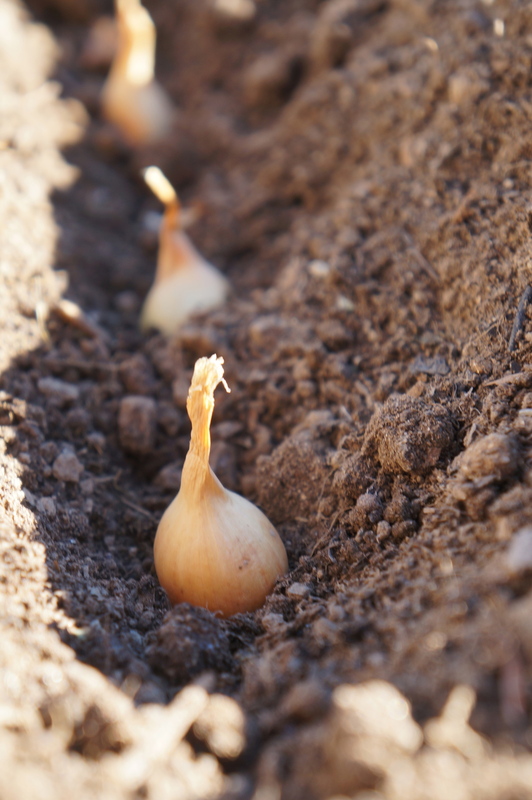 Hard-necks are much more flavorful garlics, some with huge cloves, yet they don’t last nor travel as well as the soft-neck varieties, so you will find these at your area’s farmers markets or specialty shops. As our garden starts to wind down for the winter, we have ended up with quite a bit of empty space, especially after we harvested all of our sweet potatoes, husk tomatoes and the last of our annual herbs. So what to do with all of this space? Some of it has been planted with winter greens; kale, cabbage, collards, kohlrabi, cauliflower, lettuce, arugula, beets, radish, turnips, etc, but there is still much more space that’s just empty. The answer? Cover crop. Plants take quiet a bit of nutrients from the soil, some more than others, and some even put nutrients back in, more on that later. Certain plants take certain nutrients, and this is why it is super important to do two things: crop rotation, and the reintroduction of these nutrients. Adding fertilizer is one very easy way of doing that, and there are many options for that; commercial fertilizer from a garden center, composted manure or composted plants from last years garden, rabbit poop, the list goes on, and we will utilize some of these options in the spring when we get the beds going again for the year. Yet that leaves a lot of time between now and then, so once again, cover crop. Cover crops are plants that are mainly used to manage soil fertility and erosion by growing in a full “cover” to add lots of organic matter and nutrients to the soil, as well as holding the soil in place with a strong root structure. We used two crops this year, clover and wheat. Why? Well a couple reasons, clover grows low to the ground, and the wheat grows high, so they grow very well together, and eventually the clover will even grow up the wheat. Clover is a legume, and legumes are amazing as they grow small nodules on their roots that are packed with nitrogen, and essential nutrient needed for healthy plants. Wheat has very strong roots that grow very deep and will therefore break up the soil and add air and allow moisture to penetrate. Lastly, when spring time comes around, we can harvest the wheat to use for food, as accents in bouquets, and even for medicinal use! The clover and the roots of the wheat will be tilled into the soil and add a ton of organic matter that will give us a super healthy bed to grow in. Totally worth out effort. After one week, looking good! Sign up with your email address to receive updates on events! Copyright 2017 The Farmers Hand's LLC. All rights reserved.